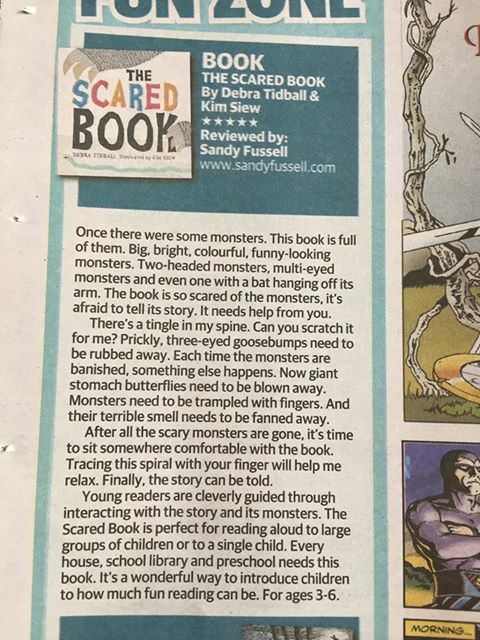 The Scared Book is a highly engaging and super fun story for kids. This is the kind of book children fall in love with and request daily. It’s the perfect book to encourage a passion for story time, and it would be a fantastic choice for reading to a group of kids (who I’m positive would thoroughly enjoy taking turns to get rid of the monsters). Excerpt: "The mixture of enlarged and weaving fonts, and the pacing of the book allows for opportunities to become emotionally invested and understand strategies for self regulation. The book gives readers scope for exploring and addressing their own positive feelings of elation, gratification and pride, and negative feelings of fear or anxiety. The encouraging finale perfectly sums up the wholesome goodness of this story, sure to inspire enthusiastic repeat reads many times over. The Scared Book is the complete, spine-tingling package for your cheeky little preschool monsters who will relish the elements of humour, quirkiness, surprise, and a dynamic tactile experience. Highly recommended." It’s a good book because it puts the child in charge and they have to step up and become the hero to save the book from being scared… which in turn, shows how easy it is to take away the fear of monsters!!" Excerpt: "The Scared Book by Debra Tidball and illustrated by Kim Siew is a delightfully funny read that not only entertains young readers, it also teaches them about feelings and how those feelings are very normal. Through interaction, children learn that there are easy ways to make those uncomfortable feelings go away if you look at the fun and positive side of life." Excerpt: "The ending empowers the reader, and will no doubt create demand for repeat reads." Excerpt: This is a fantastic interactive book which the kids at my storytime loved joining in on. This is the perfect "scary" story for younger readers - they will love  it"